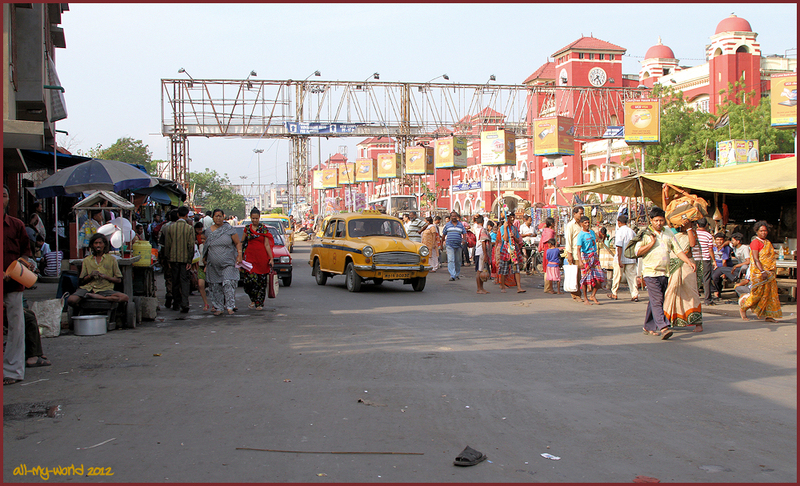 Here we are at Howrah Railway Station...one of the four major stations in Kolkata. It is beside the Hugli River, a distributary of the mighty Ganges River, so we ask the taxi driver to find a park and give us 40 minutes to walk to the river to observe what might be happening there [and that is what I'll show next week]. 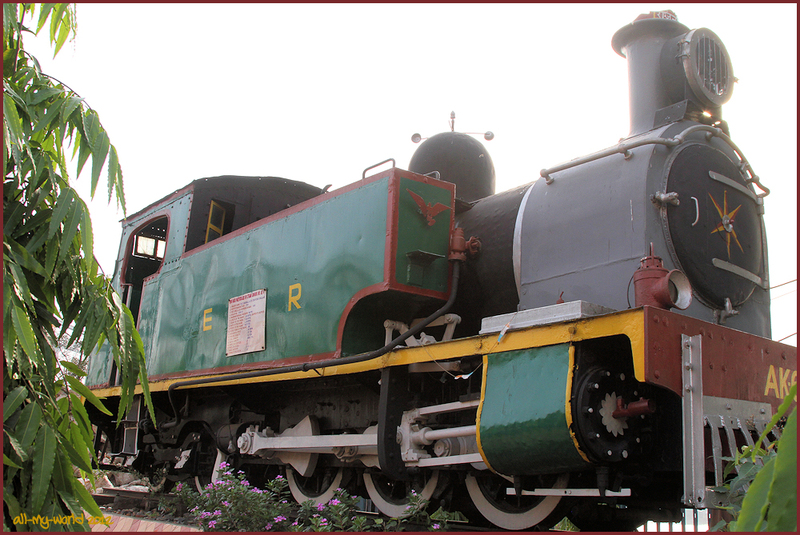 We find this old steam loco consigned to a plinth near the railway station. Ray: Quite a blast of pleasing hues here, Elizabeth. Exactly as Elizabeth said, the color is what diminishes the congestion for me...a bit! Ray: The railway station building dominates here, Ginnie, and its strong pleasing hue does leave a positive impression. Très jolie gare. J'aime les taxis jaunes comme ceux du Cameroun. Ray: C'est un impressionnant bâtiment de la gare, Martine. It is an impressive railway station building, Martine. I don't know what to expect in Kolkata, not this wonderful building. I have to say what an experience this is in that bright yellow cab, Ray. Ray: Stay with me, Astrid...we still have much to see in Kolkata. Ray: It is good that they showcase the steam loco, Chris, but I would rather it was chuffing along a track that perched on a plinth. The good old days of the British empire. It is a very impressive structure. 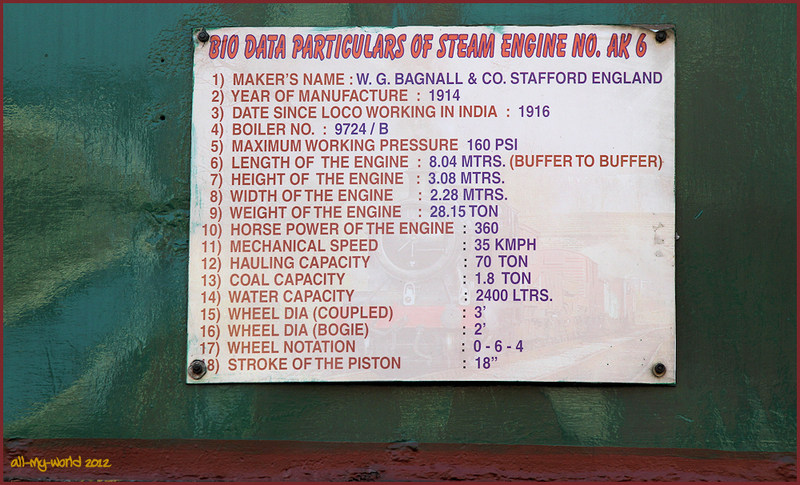 Bagnall was a prolific loco builder specialising in mainly small industrial and narrow gauge locomotives. Ray: Just guessing, Alan, but I feel this was running originally on a 30 inch gauge track. Ray: 70 0r 80 years in service, Lisl...it would have done a huge amount of work! Toujours aussi coloré et impressionnant !! Ray: L'Inde est un pays fascinant et merveilleux, Claudine. Ma série sur Kolkata durera environ 3 semaines de plus. India is a fascinating and wonderful country, Claudine. My series on Kolkata will run for about 3 weeks more. We built railways all around the world...now we can't even run our own! Ray: Unlike most of Asia, India still has extensive railways, Bill...I have travelled a bit on India railways and found it memorable! Kind of them to write in English Ray. That railways station looks large and impressive, yet somewhat devoid of ornament. It is as if it were built with engineering bricks. Ray: English is widely written in India, Chad, and probably more in Kolkata than most other places as this was the capital city of India in the time of the Raj. That station is a magnificent building, they certainly knew how to build 'grand' back in the old days. Nice old loco standing there as well. Ray: Naturally I would have preferred to see this loco chuffing along a track, Brian. I like the paint job on the building. Ray: I like it too, and it looks fresh. Ray: The taxis are a 60-70 years old design [English Morris Major] but they were made in India until 2014, Peter. i have to confess i do not have pictures on the Howrah side, so i will look forward to your series... 70 tons is impressive hauling capacity for that locomotive, Ray. Ray: We went to the Howrah side mainly for the river, Ayush, as it was high on my bucket list...it will feature a lot from next week, and I hope you will find some things of interest. Lot of yellow in that top picture. The station building is a looker, but I see many pink buildings. Not your normal rundown Indian city. At least from these perspectives. Ray: This building seemed especially fresh, Louis, although it is more than 100 years old. It is India's biggest railway complex, includes 23 platforms and services more than 620 passenger trains each day. Ray: Te building has Raj writ all over it, Larry, and the Ambassador cabs are English Morris Majors from mid 20th century.